Phylogenetic hypothesis of the Asteroidea based on Blake (1987). These relationships, as well as intra-order relationships, are contentious and re-evaluation of asteroid phylogeny continues (see Discussion of Phylogenetic Relationships, below). The Asteroidea is one of the largest and most familiar classes within the Phylum Echinodermata. 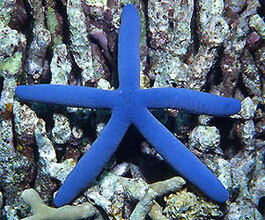 These animals, commonly known as sea stars or starfishes, form a diverse and speciose group. There are approximately 1600 extant species (Hyman 1955; Clark 1977; Clark and Downey 1992) which are found throughout the world's oceans. Following the classification of Blake (1987), these species are grouped into seven orders: Brisingida, Forcipulatida, Notomyotida, Paxillosida, Spinulosida, Valvatida and Velatida. Like other echinoderms, asteroids are important members of many marine benthic communities. They can be voracious predators, having significant impacts on community structure. 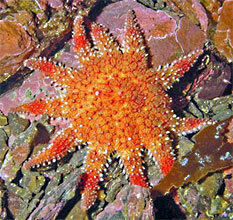 For example, Paine (1966) used Pisaster ochraceus to illustrate his concept of the role keystone species play in community ecology. The crown-of-thorns starfish, Acanthaster planci, is particularly well-known because it can cause extreme detrimental effects to coral reefs, particularly during population outbreaks (Moran 1988). 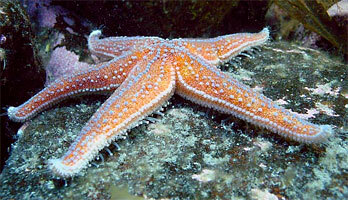 Figure 1: Pisaster ochraceus and Acanthaster planci, two asteroids of great ecological significance. 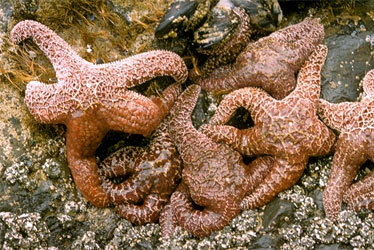 Pisaster image by Sherry Ballard, courtesy CalPhotos, copyright © 1999 California Academy of Sciences. 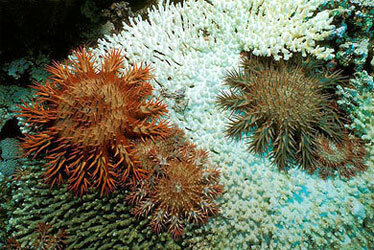 Acanthaster image copyright © Borut Furlan. The controversial Concentricycloidea (a proposed sixth class of the Echinodermata; Baker et al. 1986, Rowe et al. 1988, Pearse and Pearse 1994) have been diagnosed as unusual asteroids (Smith 1988, Belyaev 1990, Janies and Mooi 1999). Their relationship to other asteroid taxa is not well resolved, but alliances with species from the Velatida and the Forcipulatida have been proposed. The unique morphology of the concentricycloids makes it difficult to assign this group to the recognized asteroid orders and is cited as sufficient distinction for class recognition. Like other asterozoans, asteroids have a characteristic star-shaped body plan consisting of a central disc and multiple (typically 5) radiating arms. Asteroids are most easily distinguished from other asterozoans (the Ophiuroidea) by the structure of the arms. In asteroids, skeletal support for the arms is provided by the ossicles of the body wall, which merge with those of the central disc, giving the arm a very broad based attachment to the disc. This skeletal arrangement allows for the extension of a comparatively large coelomic cavity from the central disc into the arms, which serves to hold some of the animal's organ systems, namely the gonads and pyloric caeca. Additionally, this skeletal arrangement also limits lateral flexion of the arms. Locomotion by asteroids is accomplished almost exclusively by means of the podia (tubefeet) from the water vascular system. Differences in morphology between asteroids and ophiuroids are described further in Blake (1998) and Dean (1999). 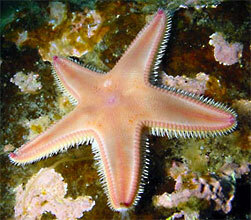 Figure 2: A typical starfish, Asterias rubens, with tubefeet visible on the edge of the arm in the foreground. Image copyright © 2004 Kåre Telnes. Cushion stars, like this Culcita novaeguineae, may have arms so short that they look more like a ball than a star. Image copyright © 2003 Massimo Boyer. Taxonomy of asteroids usually is based on externally observable characteristics of the skeleton, particularly the primary ossicular series which define the body wall (ambulacrals, adambulacrals, marginals, terminals, actinals, abactinals), as well as secondary ossicles such as spines, spinelets and pedicellariae. Works by Perrier (1884) and Sladen (1889) laid the taxonomic foundation of most asteroid groups. Many other authors have contributed to and/or refined the asteroid classification scheme, notably Fisher (1911, 1928), Verrill (1914), Fell (1963), Spencer and Wright (1966) and McKnight (1975). Blake and Elliot (2003) provide clear definition of ossicle terminology. Blake (1987) provides classification and diagnoses of asteroid groups. Perhaps the most important ossicular series defining the Asteroidea is the ambulacral column, found along the oral surface of the disk and radiating arms and associated with two or four rows of podia. The asteroid ambulacrum is distinguished by erect ambulacral ossicles arranged in series along the length of the ambulacral column. Critical differences in structure and arrangement of the ossicles of the ambulacral column define two groups of asteroids: an extinct fauna restricted to the Paleozoic and the mostly extant (mostly) post-Paleozoic asteroids (Blake 1987, Gale 1987). Blake and Hagdorn (2003) recently recognized this distinction formally with diagnosis of a new subclass: Ambuloasteroidea, containing the Paleozoic Calliasterellidae and Compsasteridae in addition to post-Paleozoic asteroids (Infraclass Neoasteroidea Gale 1987). Figure 3: Morphology of asteroids. A, aboral and oral surfaces of a generalized asteroid. Image © BIODIDAC. B, transverse section and perspective view of a generalized arm (soft tissues and spines removed); note the arched ambulacral ossicles forming the ambulacral groove and the dorsal podial pores between ambulacral ossicles. One podium (tubefoot) on the left is drawn in outline only to illustrate how the podia descend through the podial pores. Image © 2004 Emily Knott. Application of the extraxial-axial theory (EAT) to asteroid morphology significantly aids our understanding of ossicle homologies within the Asteroidea and between asteroids and other echinoderms (Mooi and David 2000, Blake and Elliot 2003, Blake and Hagdorn 2003). According to the EAT, the ambulacral and terminal ossicles of asteroids are axial elements. These ossicles are formed according to the Ocular Plate Rule (OPR) and are associated with the developing water vascular system during ontogeny as are the axial ossicles of other echinoderms. The remaining asteroid ossicle series are extraxial elements, which can be added during ontogeny without any particular ordering system (although secondarily ordered serial homologous elements are common in the asteroids, e.g. adambulacrals and marginals). In comparison to axial elements, extraxial ossicles are prone to much more evolutionary lability (Mooi and David 1997). Summarized from Blake (1998; 2000), Mooi and David (2000) and Blake and Hagdorn (2003). Deep ambulacral groove—The paired ambulacral ossicles are erect and arch across the arm axis forming a clearly defined furrow. The extent of the arch and definition of the furrow are expected to be weaker in the earliest asteroids, but these characters are difficult to observe in most fossil specimens. Dorsal podial pores—The dorsal podia pores are passageways between ambulacral ossicles through which the tubefeet descend. These pores allow for internal protection of the ampullae, dorsal outpockets of the podia, which contract and expand with extension and retraction of the podia. The ampullae of earlier asteroids were external, in closed, cup-like podial basins formed by the ossicles of the ambulacral column. Offset positioning of the ambulacral and adambulacral ossicles and differentiation of articulation structures in ossicles of the ambulacrum—These features describe a variety of related apomorphic characteristics of ambuloasteroids. Offset positioning of the ambulacral and adambulacral ossicles allows for soft tissue connections between the ambulacral and both adjacent adambulacrals which is further enhanced with differentiation of articulation structures on the ossicles. This arrangement allows more complex movement in the ambuloasteroids. In non-ambuloasteroids a single ambulacral ossicle abuts a single adambulacral. Presence of an odontophore—The odontophore is a small interradial ossicle associated with the mouth angle ossicle. The odontophore is expected to the homologue of the axillary in Paleozoic asteroids. The earliest asteroids appeared in the Ordovician (Figure 4). However, at least two major faunal transitions have occurred within the Asteroidea concomitantly with large extinction events: in the Late Devonian (Blake and Glass in Webster et. al. 1999) and in the Late Permian (Blake 1987, Gale 1987, Blake et al. 2000, Blake and Elliot 2003, Blake and Hagdorn 2003). The asteroid orders as described here contain all extant and some extinct species which have a morphology distinct from Paleozoic forms (i.e. Ambuloasteroidea; see Characteristics, Blake 1982, 1987, 1988; Gale 1987, Blake and Elliott 2003, Blake and Hagdorn 2003). The asteroid orders are thought to have appeared and diversified very rapidly (within approximately 60 million years) during the Lower and early Middle Jurassic, frustrating our understanding of ordinal relationships (see discussion below). Figure 4: Hudsonaster sp. (USNM 40882), an early asteroid from the Ordovician. Relationships among Paleozoic asteroids, as well as between Paleozoic asteroids and extant asteroids, are difficult if not impossible to determine because of the limitations of the asteroid fossil record. Asteroid fossils are rare because 1) the skeletal elements rapidly dissociate after death of the animals 2) asteroids typically have a large body cavity that collapses with deterioration of the organs, resulting in misshapen forms and 3) asteroids often live on hard substrates which are not conducive to fossil formation. From the limited fossil evidence that is available we know that the basic body plan of the asteroids has remained the same since the Ordovician. Several papers by Blake (e.g 1989, 2000) describe limitations of the fossil record in detail. Despite the paucity of the asteroid fossil record, fossil evidence has aided our understanding of asteroid evolution within both the Paleozoic and post-Paleozoic groups. One unique fossil fauna is that from the Hunsrück Slate of Germany from the Lower Devonian. These Paleozoic forms are well preserved and show a variety of morphologies. The diversity exhibited in this faunal representation suggests that the diversity of life habits of Paleozoic asteroids was probably very similar to what we see today in modern species (Blake 2000). Fossil members of the post-Paleozoic fauna have also been found. The oldest known neoasteroid is the extinct Triassic genus Trichasteropsis (Blake and Hagdorn 2003, Figure 5). Blake (1987) recognized a new order, Trichasteropsida, to contain this taxon. The slightly younger Triassic genus Noriaster barberoi, diagnosed to the extant family Poraniidae (Valvatida), is the oldest-known fossil species belonging to a surviving family (Blake et al. 2000, Figure 5). A survey of asteroid nomenclature arranged by order has been compiled. Clark (1989, 1993, 1996) and Clark and Mah (2001) list accepted names as well as synonyms, otherwise invalid names, references and ranges of type localities. Brisingida—Brisingids are deep-sea dwelling asteroids. They usually have many (6-16) long, attenuated arms which are used in suspension feeding. The Brisingida contains about 100 species in 17 genera and 6 families. A preliminary phylogeny for this order has been produced by Mah (1998). Forcipulatida—These asteroids are distinguished by their forcipulate pedicellariae, which are generally quite conspicuous on the body surface. The Forcipulatida contains about 300 species in 68 genera and 6 families. A preliminary phylogeny for this order has been produced by Mah (2000). Notomyotida—These are deep-sea dwelling asteroids having flexible arms with characteristic longitudinal muscle bands along the inner dorsolateral surface. The Notomyotida contains about 75 species in 12 genera and 1 family. Paxillosida—These asteroids are considered to be somewhat infaunal in that they can bury themselves partially under sandy sediments. They are characterized by some morphological features (e.g. pointed, unsuckered tubefeet) which have been considered primitive by some (see Discussion of Phylogenetic Relationships, below). The Paxillosida contains about 255 species in 46 genera and 5 families. Spinulosida—These asteroids have a relatively delicate skeletal arrangement and completely lack pedicellariae. No fossil spinulosids have been found. The Spinulosida contains about 120 species in 9 genera and 1 family. Valvatida—These asteroids are quite diverse, but are often characterized by their conspicuous marginal ossicles. Definition of this group has been the most variable and the ordinal definition of many families included here has been controversial (see Discussion of Phylogenetic Relationships, below). The Valvatida contains about 695 species in 165 genera and 14 families. Velatida—These asteroids typically have thick bodies with large discs and interradial depressions. Contrary to Blake's (1987) classification, molecular evidence suggests a relationship between some velatid and valvatid families (see Discussion of Phylogenetic Relationships, below). The Velatida contains about 200 species in 25 genera and 5 families. Specific use of phylogenetic methods in studies of asteroid evolutionary relationships began in the late 1980s. These analyses (using both morphological and molecular data) have resulted in conflicting hypotheses of asteroid phylogeny. Phylogenetic analyses are continuing to be re-evaluated with additional data. Since their results are still somewhat contentious, they have yet to initiate changes in our classification system. In 1987, two differing hypotheses of order level relationships were proposed based on analyses of morphological characteristics (Blake 1987, Gale 1987, Figure 6,7). These two phylogenies differ due to differences in opinion about character polarity (assigning ancestral or derived status to a particular state of a character) and the different morphological characters used in the analyses (note that Gale does not specifically use phylogenetic methods). Both authors emphasized the importance of ambulacral characters to asteroid classification and recognized the distinction between Paleozoic and post-Paleozoic forms (i.e. Ambuloasteroidea, Blake and Hagdorn 2003). 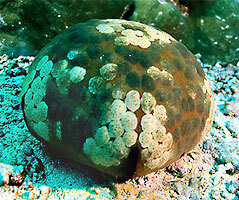 However, Gale (following McKnight 1975) focuses on the lack of suckered tubefeet in the Paxillosida, considering them primitive. As a result, his phylogeny reflects two major groups: a basal Paxillosida and the remaining asteroids, all having suckered tubefeet, which he termed superorder Surculifera. Blake considers suckered tubefeet to be the ancestral condition. His phylogeny reflects two major asteroid groups: superorder Forcipulatacea (Forcipulatida + Brisingida) and a clade of the superorders Valvatacea + Spinulosacea (Valvatida, Notomyotida, Paxillosida, Spinulosida and Velatida). Outgroup comparison with Calliasterella and inclusion of the Trichasteropsida results in a basal Forcipulatacea. Figure 6. Blake's (1987) hypothesis of Asteroidea relationships. Figure 7. Gale's (1987) hypothesis of Asteroidea relationships. The differences in these proposed phylogenies highlight questions about asteroid relationships that are still unresolved. The identification of the basal (neo)asteroid group has been the driving question of additional studies (see Evidence from molecular characters, below). Additionally, ordinal definition, particularly for Blake's Valvatida, Velatida and Spinulosida, is problematic. Such problems were not new to Blake and Gale. Although many asteroid groups can be clearly defined morphologically (Forcipulatida, Brisingida, Notomyotida), asteroid morphology is complex and diverse. Other groups are less clearly defined. Additional phylogenetic analyses incorporating molecular data with morphological data (Lafay et al. 1995) and using molecular data alone (Wada et al. 1996; Knott and Wray 2000) were presented in an effort to resolve phylogenetic arguments. Unexpectedly, these studies have done little to elucidate asteroid relationships and may have only added to the confusion. Lafay et al. (1995) present an unrooted phylogeny deduced from analysis of a combined morphological data set taken from Blake (1987) and Gale (1987) with unordered character states (Figure 8). Although very few taxa were studied, their phylogeny supports the definition of asteroid orders proposed by Blake but separates the Paxillosida from the Valvatida. Their analysis with molecular data alone (sequence data from 28S rRNA) results in several conflicting topologies due to weak phylogenetic signal. Most of this signal is masked by that from the morphological data set when the two data sets are combined. However, after evaluating several rooting positions using molecular data from other echinoderms in outgroup comparison, Lafay et al. 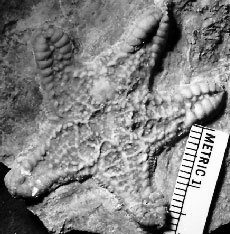 (1995) conclude that the Paxillosida may not be monophyletic and that the paxillosid genus Astropecten may be the sister group to the remaining asteroids, reminiscent of Gale's phylogeny. Wada et al. (1996) include more taxa for additional investigation of ordinal monophyly (Figure 9). In multiple analyses of their molecular data set (sequence data from 12S and 16S rDNA), they find that paxillosids are paraphyletic with the paxillosid genus Luidia as the basal asteroid taxon. In addition, the Valvatida is not monophyletic and a forcipulatid clade falls within a group of valvatids, a velatid and spinulosids, a relationship in stark contrast to that proposed by Blake (1987). Further, the Spinulosida are never grouped with the Velatida, which Blake (1987) proposed as their sister group and which previously were considered a group within the Spinulosida (Spencer and Wright 1966, McKnight 1975, Blake 1981a). Knott and Wray (2000) expand taxon sampling even more, but their molecular data set (sequence data from mitochondrial tRNA and COI genes) fails to resolve questions of asteroid phylogeny (Figure 10). Significantly, the Paxillosida is not basal in their results (although Astropecten is not included). The results of different tree reconstruction methods are not in agreement, and basal groupings are only supported by bootstrapping in the Neighbor-Joining analysis. The proposed phylogeny is similar to Blake (1987) in that two lineages (one largely of forcipulatids and the other largely of valvatids) are recovered, but Valvatida and Velatida are not monophyletic and some velatids plus the Spinulosida fall in the forcipulatid clade. Figure 8. Lafay et al. 's (1995) hypothesis of Asteroidea relationships. Figure 9. Wada et al. 's (1996) hypothesis of Asteroidea relationships. Figure 10. Knott & Wray's (2000) hypothesis of Asteroidea relationships. The position of the Concentricycloidea has been contentious since its discovery in 1986. Close relationship between the Concentricycloidea and asterozoans is expected (see Baker et al. 1986, Rowe et al. 1988, Pearse and Pearse 1994, Mooi et al. 1998), but argument over its taxonomic position continues. As yet, no changes in taxonomy have been made. The morphological features of concentricycloids are so distinct (e.g. two circumoral canals, a single peripheral ring of podia) that the tendency to recognize them as a separate echinoderm class is quite strong. Pearse and Pearse (1994) included the Concentricycloidea in a phylogenetic analysis using morphological characters defined by Blake (1987) and found that Concentricycloidea fall outside the asteroid clade. Further clarification of skeletal homologies between concentricycloids and asteroids (Mooi et al. 1998) supports asterozoan affinities, but questioned placing concentricycloids as close relative to the asteroid order Caymanostellidae (Velatida; Rowe et al. 1988, Smith 1988, Belyaev 1990). Caymanostellids and concentricycloids have superficially similar body plans which may be due to convergence rather than true relationships (Pearse and Pearse 1994, Mooi et al. 1998). Contribution of DNA sequence data from Xyloplax turnerae and phylogenetic analysis of a combined morphological and molecular data set (Janies and Mooi 1999, Janies 2001), however, supports recognizing concentricyloids as asteroids. In these analyses, Xyloplax is in a clade with the forcipulatid Rathbunaster and not with velatids (although Caymanostellidae is not represented). Support for relationships within the Asteroidea is low, but Xyloplax is positioned well within the asteroid clade. Baker, A. N., F. W. E. Rowe and H. E. S. Clark. 1986. A new class of Echinodermata from New Zealand. Nature 321:862-864. Belyaev, G. M. 1990. Is it valid to isolate the genus Xyloplax as an independent class of echinoderms? Zoologicheskii Zhurnal 69:83-96. Blake, D. B. 1982. Recognition of higher taxa and phylogeny of the Asteroidea. pp. 105-107. in: International Echinoderm Conference, Tampa Bay. J. M. Lawrence, ed. A. A. Balkema, Rotterdam. Blake, D. B. 1987. 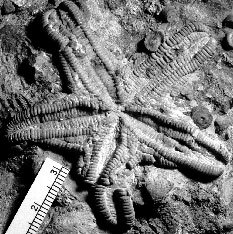 A classification and phylogeny of post-Paleozoic sea stars (Asteroidea: Echinodermata). Journal of Natural History 21:481-528. Blake, D. B. 1989. Asteroidea: Functional morphology, classification and phylogeny. pp.179-223. in: Echinoderm Studies Vol.3. A. A. Balkema, Rotterdam. Blake, D. B. 1998. Morphological characters of early asteroids and ophiuroids. pp. 5-8. in: Echinoderms: San Francisco. Proceedings of the Ninth International Echinoderm Conference. R. Mooi and M. Telford, eds. A. A. Balkema, Rotterdam. Blake, D. B. 2000. 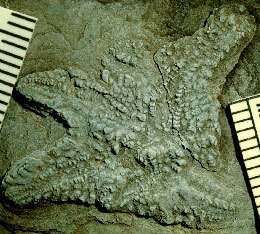 The class Asteroidea (Echinodermata): Fossils and the base of the crown group. American Zoologist 40:316-325. Blake, D. B. and D. R. Elliott. 2003. Ossicular homologies, systematics and phylogenetic implications of certain North American Carboniferous asteroids (Echinodermata). Journal of Paleontology 77(3): 476-489. Blake, D. B. and H. Hagdorn. 2003. The Asteroidea (Echinodermata) of the Muschelkalk (Middle Triassic of Germany). Paläontologische Zeitschrift 77(1):23-58. Blake, D. B., A. Tintori and H. Hagdorn. 2000. A new, early crown-group asteroid (Echinodermata) from the Norian (Triassic) of Northern Italy. Rivista Italiana di Paleontologia e Stratigrafia. 106(2):141-156. Clark, A. M. 1977. Starfishes and related echinoderms. T. F: H. Publications, London. Clark, A. M. 1989. An index of names of recent Asteroidea: Part 1. Paxillosida and Notomyotida. Pp.225-347 in: Echinoderm Studies Vol. 3. M. Jangoux and J. M. Lawrence, eds. A. A. Balkema, Rotterdam. Clark, A. M. 1993. An index of names of recent Asteroidea: Part 2. Valvatida. Pp.187-366 in: Echinoderm Studies Vol. 4. M. Jangoux and J. M. Lawrence, eds. A. A. Balkema, Rotterdam. Clark, A. M. 1996. An index of names of recent Asteroidea: Part 3. Velatida and Spinulosida. Pp.183-250 in: Echinoderm Studies Vol. 5. M. Jangoux and J. M. Lawrence, eds. A. A. Balkema, Rotterdam. Clark, A. M. and M. E. Downey. 1992. Starfishes of the Atlantic. Chapman and Hall, London. Clark, A. M. and C. Mah. 2001. An index of names of recent Asteroidea: Part 4. Forcipulatida and Brisingida. Pp.229-347 in: Echinoderm Studies Vol. 6. M. Jangoux and J. M. Lawrence, eds. A. A. Balkema, Rotterdam. Dean, J. 1999. What makes and ophiuroid? 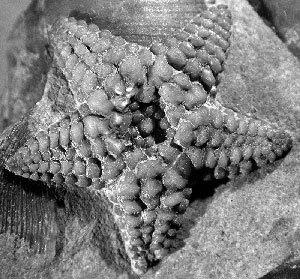 A morphological study of the problematic Ordovician stelleroid Stenaster and the paleobiology of the earliest asteroids and ophiuroids. Zoological Journal of the Linnean Society 126:225-250. Fell, H. B. 1963. The phylogeny of sea-stars. Philosophical Transactions B 246:381-435, 2 pls., 16 figs. Fisher, W. K. 1911. Asteroidea of the North Pacific and adjacent waters. Part1: Phanerozonia and Spinulosa. Bulletin of the United States National Museum. 76. xiii + 420pp., 122 pls. Fisher, W. K. 1928. Asteroidea of the North Pacific and adjacent waters. Part2: Forcipulata. Bulletin of the United States National Museum. 76:1-245, 81 pls..
Gale, A. S. 1987. Phylogeny and classification of the Asteroidea (Echinodermata). Zoological Journal of the Linnean Society 89:107-132. Janies, D. 2001. Phylogenetic relationships of extant echinoderm classes. Canadian Journal of Zoology 79:1232-1250. Janies, D. and R. Mooi. 1999. Xyloplax is an asteroid. pp. 311-316. In: Echinoderm Research 1998. M. Candia Carnevali and F. Bonosoro, eds. A. A. Balkema, Rotterdam. Knott, K. E. and G. A. Wray. 2000. Controversy and consensus in asteroid systematics: new insights to ordinal and familial relationships. American Zoologist 40:382-392. Lafay, B., A. B. Smith, and R. Christen. 1995. A combined morphological and molecular approach to the phylogeny of asteroids (Asteroidea: Echinodermata). Systematic Biology 44(2):190-208. Mah, C. L. 1998. Preliminary phylogeny and taxonomic revision of the Brisingida (Asteroidea). pp. 273-277. in: Echinoderms San Francisco: Proceedings of the Ninth International Echinoderm Conference. R. Mooi and M. Telford, eds. A.A. Balkema. Rotterdam. Mah, C. L. 2000. Preliminary phylogeny of the Forcipulatacean Asteroidea. American Zoologist 40:375-381. McKnight, D. G. 1975. Classification of somasteroids and asteroids (Asterozoa: Echinodermata). Journal of the Royal Society of New Zealand. 5:13-19. Mooi, R. and B. David. 1997. Skeletal homologies of echinoderms. The Paleontological Society Papers 3:305-335. Mooi, R. and B. David. 2000. What a new model of skeletal homologies tells us about asteroid evolution. American Zoologist 40:326-339. Mooi, R., F. W. E. Rowe and B. David. 1998. Application of a theory of axial and extraxial skeletal homologies to concentricycloid morphology. pp. 61-62. in: Echinoderms San Francisco: Proceedings of the Ninth International Echinoderm Conference. R. Mooi and M. Telford, eds. A.A. Balkema. Rotterdam. Moran, P. J. 1988. The Acanthaster phenomenon. Australian Institute of Marine Science Monograph Series Vol. 7. 78 p.
Pearse, V. B. and J. S. Pearse. 1994. Echinoderm Phylogeny and the place of the concentricycloids. pp. 121-126. in: Echinoderms Dijon: Proceedings of the Eighth International Echinoderm Conference. B. David, A. Guille, J.-P. Feral and M. Roux, eds. A.A. Balkema. Rotterdam. Perrier, J. O. E. 1884. Mémoire sur les étoiles de mer recueillies dans la Mer des Antolles et le golfe de Mexique. Nouvelles Archives du Muséum d'Histoire Naturelle, Paris (2)6:127-276. Rowe, F. W. E., A. N. Baker, and H. E. S. Clark. 1988. The morphology, development and taxonomic status of Xyloplax Baker, Rowe and Clark 1986 (Echinodermata: Concentricycloidea), with the description of a new species. Proceedings of the Royal Society of London Series B: Biological Sciences 223:431-459. Sladen, W. P. 1889. Asteroidea. Report of the scientific results of the voyage of H.M.S. Challenger, 1873-1876. Zoology 30:1-935. Smith, A. B. 1988. To grop or not to group: the taxonomic position of Xyloplax. pp. 17-23. in: Echinoderm Biology. R. D. Burke, P. V. Mladenov, P. Lambert and R. D. Parsley, eds. A. A. Balkema, Rotterdam. Spencer, W. K. and C. W. Wright. 1966. Asterozoans. Treatise on Invertebrate Paleontology. Part U Echinodermata. 3(1):U4-U107. University of Kansas Press. Verrill, A. E. 1914. Monograph of the shallow-water starfishes of the North Pacific coast from the Arctic Ocean to California. Harriman Alaska Series of the United States National Museum 14:1-408, 110 pls. Wada, H., M. Komatsu and N. Satoh. 1996. Mitochondrial rDNA phylogeny of the Asteoidea suggests the primitiveness of the Paxillosida. Molecular Phylogenetics and Evolution 6(1):97-106. Webster, G. D., D. J. Hafley, D. B. Blake and A. Glass. 1999. Crinoids and stelleroids from the Broken Rib Member, Dyer Formation Late Devonian, Famennian. of the White River Plateau, Colorado. Journal of Paleontology 73(3):461-486. Page: Tree of Life Asteroidea. Sea stars and starfishes. Authored by Emily Knott. The TEXT of this page is licensed under the Creative Commons Attribution-NonCommercial License - Version 3.0. Note that images and other media featured on this page are each governed by their own license, and they may or may not be available for reuse. Click on an image or a media link to access the media data window, which provides the relevant licensing information. For the general terms and conditions of ToL material reuse and redistribution, please see the Tree of Life Copyright Policies.